Lee: So, Greg. What exactly is a social media consult, and who might want one? Greg: Well, if you're active on social media - whether it's Facebook or Twitter or Instagram or blogging or anything in between - or think you're going to be active or have been told you should be active then you might want a consultation. My goal with a consult is to help each person figure out a plan to use their online time efficiently and effectively, no matter what they're doing already (or not!). The plan will look different for everyone and depends on individual goals and how much time folks can actually spend online. There's a constant drumbeat that wherever you are in your career arc, you have to be getting the word out or helping sales or establishing a presence or any number of other things. It can sound unachievable if not impossible, particularly since we all have lives to live, too. Still, with a plan and realistic goals, you can do more than enough and still have time to work. That's what the consult helps with, I think. Lee: Let's role-play. I've just signed up for a social media consult. What do I have to do next? Greg: I send out a simple questionnaire before the conference so I can find out what you're already doing online, if anything, what you want to accomplish, how much time you realistically think you can spend, and what social media questions you have (cuz we all have some!). It only takes a few minutes to fill out... and that's all that you have to do beforehand. Greg: We meet at the conference and talk! I also give you a written set of notes, and we work together to hatch a plan. You leave with definite steps to take. And then you can follow up with me after the conference - these consultations come with 30 minutes phone/skype/in person afterwards, since new questions have a way of popping up when you try new things. 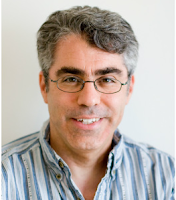 Greg: Social media can be a lot of fun at the same time as being helpful for a career. Sure, I'd tell you that you don't HAVE to do any of it (and if you really can't, don't feel guilty!). Still, if you're thinking about social media, I can't stress enough that having a plan and goals turn your time there from mindless procrastination into career action (and you'll probably have fun then, too). You can sign up for social media consultations until July 20. Of course, to do that you'll have to be registered for the amazing Summer Conference. You'll find all the information here. The Society of Children’s Book Writers and Illustrators has created a member category for Translators. Why? Children deserve to explore their whole planet through books. Translators bring them books written in many languages, in many places. As a benefit for member translators, SCBWI offers a new, worldwide email list focused on translation of children’s literature: SCBWI Translation. In addition, Summer Conference 2015 will feature the first translation workshop at an Annual Conference: “The Art and Business of Translation” by Nanette McGuinness. Nanette is a prolific translator from French and Italian into English, of conventional and graphic novel series including Sherlock, Lupin & Me and Geronimo Stilton Graphic Novels. Avery: How did you become a translator of children’s books? What studies and experiences prepared you? Nanette: I spoke French before English and have written all my life, despite being a singer. In addition to having a Master’s in Vocal Performance, I’ve also got a PhD specializing in musicology—essentially, writing about music history. During an extended period of health issues when it was harder to perform, I found myself drawn to writing for children, as I’d never lost my love of children’s books. I also found myself drawn to literary translation. Yet the entry point to translating children’s books wasn’t clear. I started writing articles and stories and doing commercial translation, hoping to find literary work. About seven years later (health and singing career once again thriving), I was looking for the right house for a manuscript submission when I bumped into a publisher who needed a translator. • Plus when I’m not singing or translating, I read, read, read. Avery: What is a recent project you are excited about? Nanette: Last year, I translated four upper MG novels that I really enjoyed. 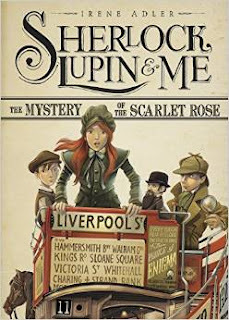 Two come from a wonderful series about a teenage Sherlock Holmes who solves mysteries with his friends: Sherlock, Lupin, and Me. The stories are well executed, with excellent local historic color and good writing. 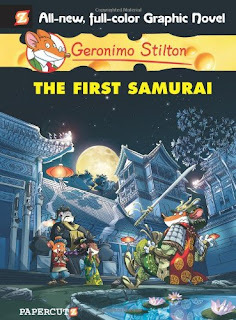 I was thrilled to see that the first volume—from before I came on board for the third and fourth volumes—is on the International Literacy Association’s Children’s Choices 2015 Reading List. • Not a translation nor for children: a new CD, Survivors: Women’s Words, due out on Centaur Records in 2016. Avery: You have translated both graphic and conventional novels. What are some differences between these forms that have affected your work as translator? Nanette: Structurally, a graphic novel (GN) is more like a picture book than it’s like a conventional novel, in that in a GN over half the narrative and plot are carried by the illustrations. Except for sidebars and captions, the text is almost exclusively dialogue. As a result, much is left out in the text and only made clear in the illustrations. • Length and scale, i.e., long form vs. short form. A conventional novel has tens of thousands more words than a GN, so translating a conventional novel takes different pacing and stamina. • While there’s always dialogue, it carries much less narrative “weight” in a conventional novel, where there are extensive paragraphs of pure description. These require different kinds of thinking and internal listening, I find. • Due to the different proportion of dialogue to description and also the length of the text, it feels as though I need to get much more deeply under the “skin” of the author’s and characters’ voices. • GNs tend to be “slangy/talky” and less formal than conventional novels. For either, it’s important that I leave myself enough time to translate, proofread several times and then put the story aside, so that I can re-read it later with fresh eyes and ears in order to make sure that I’ve captured the voice, story, and characters and that all the pieces of the new, translated whole sound organic and true. Avery: You perform as a professional opera singer. How does this career connect with your work in translation? Nanette: As an opera and classical singer, I spend part of every day working in multiple languages—what a joy! And when I’m performing abroad, the cast, crew, conductor, etc., often speak different languages. Singing and translating are highly creative acts that involve the recreation of another artist’s vision. In both, I apply my musicality to words—my inner sense of rhythm, pacing, flow, etc.—and communicate meaning across different media. So I take one set of symbols—a text in one language or music in written notation—and transfer the content into another medium—another language or a live performance. Although making music is more than simply interpreting written notation, the basic analogy of singing to translating works surprisingly well. Interestingly, both activities are much like a duck gliding across a pond: when done well, singing and translating appear effortless and smooth to the eye, while there’s actually a good deal of mad paddling and hard work going on below the surface to give that easy appearance. Tiny disturbances immediately ruffle the surface. Avery: Please describe one challenge you have faced as a translator. Nanette: Literary translation is a labor of love, as is all creative work: on average, it does not pay well and takes time to do right, and there’s always someone else willing to step into your shoes for less. With everything on computers, good ergonomics are a constant challenge, as is finding the time to do everything I love. Avery: Please tell us about a children’s book in one (or more) of your source languages that you love. Nanette: How about a book and a series? • Le petit prince, by Antoine de Saint-Exupery (in English, The Little Prince), one of the most translated and adapted books in the world. 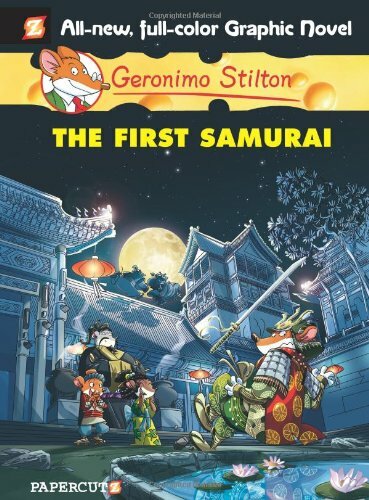 • The Asterix series, French graphic novels about two incorrigible, unconquerable buddies from the time of the Roman empire. Written with tongue firmly in cheek, these have continued to tickle my punny bone ever since I encountered them. Avery: What are your all-time favorite children’s books in translation, from/into any language? Nanette: Heidi (by Johanna Spyri), which changed my life: because of Heidi, I chose to go to Switzerland as an exchange student. The Tomten—a timeless, beautiful picture book—Pippi Longstocking (both by Astrid Lindgren), the Moomin series by Tove Jansson, and the stories of Hans Christian Andersen. Plus the basics—Aesop’s Fables, Mother Goose, and the Brothers Grimm. Among graphic novels, Hergé’s Tintin series is a classic. For translations out of English, Roald Dahl’s Charlie and the Chocolate Factory and Lewis Carroll’s Alice in Wonderland and Through the Looking Glass. Avery: Thank you so much for this interview! I know many will want to visit your website and check out your workshop at Summer Conference 2015. Nanette: Thanks for the great questions, Avery! 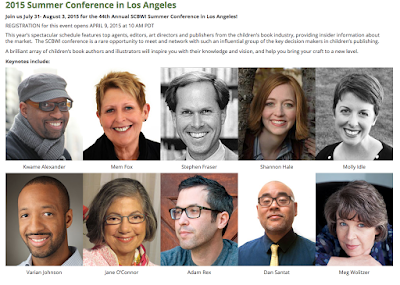 To attend Nanette's breakout session, "The Art and Business of Translation," register for #LA15SCBWI here. "...I think my biggest piece of advice for anyone who wants to write is to turn off that voice in your head that says you can't do it, that it's no good, that you're no good, that no-one will ever read it, because that voice never goes. And you can have the most success as a novelist and you'll still hear that voice. And I think a lot of writing is overcoming that voice in your head that tells you you can't do it. So, find a way to silence that voice, and sit down, and write." - Christie Watson, author of "Where Women Are Kings," from her podcast interview with Nicole Nelson on "Writers on Writing," 40:00 minutes in. Early Registration For the 2015 SCBWI Summer Conference Ends Tuesday June 23, 2015! The top agents, editors, art directors and publishers from the children’s book industry, providing insider information about the market. The SCBWI conference is a rare opportunity to meet and network with such an influential group of the key decision makers in children’s publishing. A brilliant array of children’s book authors and illustrators who will inspire you with their knowledge and vision, and help you bring your craft to a new level. SCBWI Success Stories with Martha Brockenbrough, Anna Shinoda, Mike Curato, Lori Nichols, and Stacey Lee. Moderated by Lee Wind. Diversity Panel with Joe Cepeda, Brandy Colbert, I.W. Gregorio, Varian Johnson, and Nicola Yoon. Moderated by Miranda Paul. PLUS: Small group targeted breakout workshops will give you take-away skills and concrete tips on all aspects of the field. Optional classroom-sized intensives with our keynotes and panelists on the final day give you an opportunity to dig into your work-in-progress, and make it the best it can be. Whether you are an author or illustrator, published or unpublished, creator of picture books or young adult novels or nonfiction, you won't want to miss the SCBWI Summer Conference! The Summer Conference will be held at the Hyatt Regency Century Plaza in Los Angeles, July 31 - August 3, 2015. Early registration (and its discount) ends Tuesday June 23rd! Go here for all the information. Children who have read the stories of many countries would have a stronger foundation for understanding international diversity. They’d be better able to respect differences and react with sympathy. Many would be able to experience the stories from the countries of their family origins. 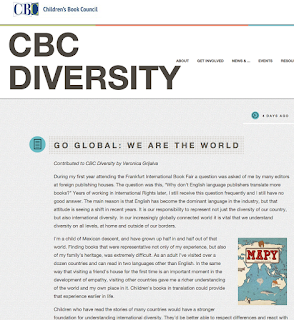 Young readers today have an unprecedented access to children and media from other countries. I moderate a forum for teens with registered users from over 30 countries, and it’s not unusual to have to step in and explain cultural differences during inevitable arguments. Imagine if those children had a frame of reference for those interactions, if they had lived in that culture in the pages of a book. Educators might worry that young readers would be hesitant to read stories that aren’t set in their home country but, if a child can enjoy stories set in fantasy worlds, their unfettered imaginations can imagine and enjoy fantastic experiences set half a world away. 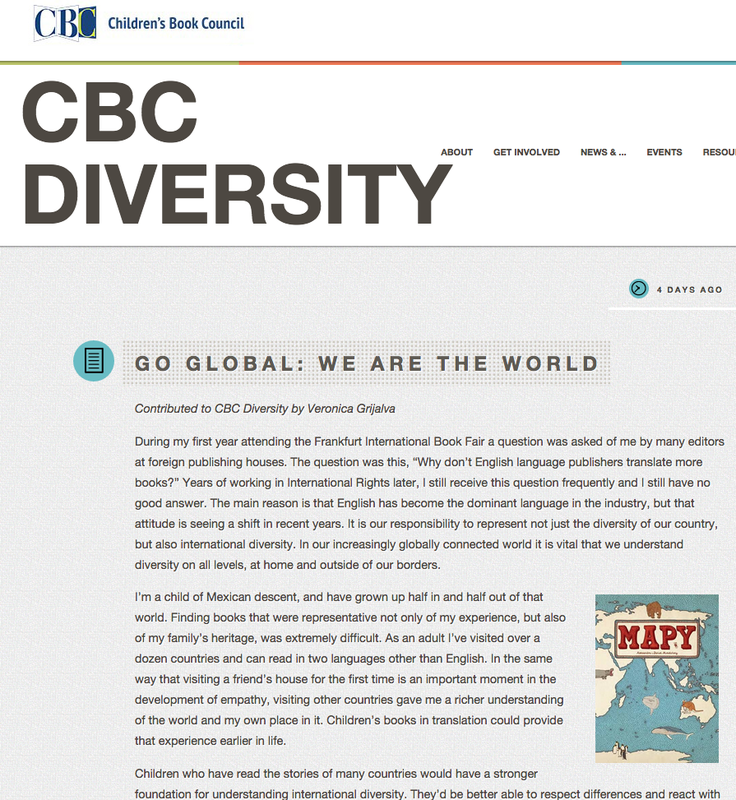 Books in translation could also offer unique teaching opportunities, as supplements to social studies, geography, and history lessons. They could act as a foreign exchange trip without having to leave the classroom. Veronica acknowledges the challenges of books in translation, and cites a number of resources in the article to "help you Go Global." They are worth checking out. 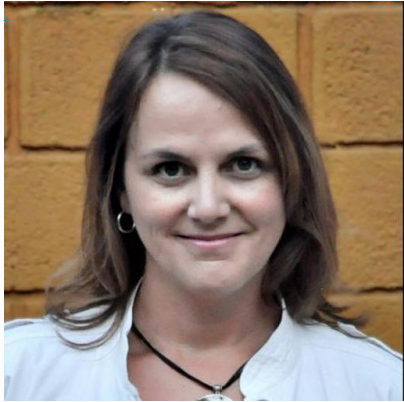 Also, if translation is something you want to learn more about, there will be a breakout workshop on the Saturday August 1st of the upcoming 2015 SCBWI Summer Conference in Los Angeles, "The Art and Business of Translation," offered by Nanette McGuinness. Nanette is the translator of two dozen books for children and young adults, including the popular Geronimo Stilton Graphic Novel series, Dinosaurs Graphic Novels, Thea Stilton Graphic Novels, and the recently-released middle grade novels Mystery of the Scarlet Rose (Sherlock, Lupin & Me, #3) and Map of the Passages (Enchanted Emporium, #3). 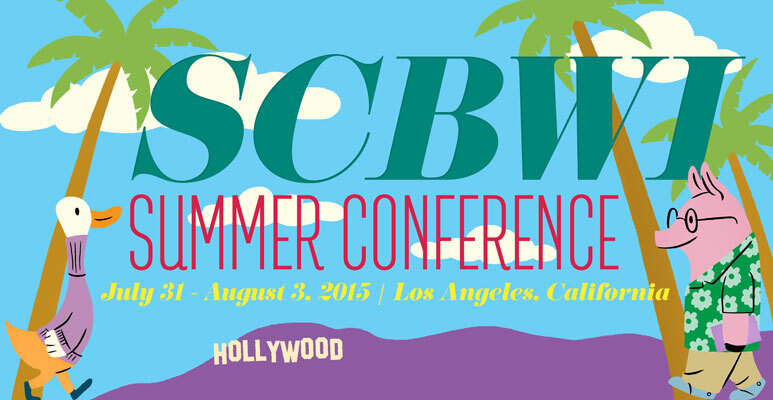 You can find out more about the 2015 SCBWI Summer Conference here. 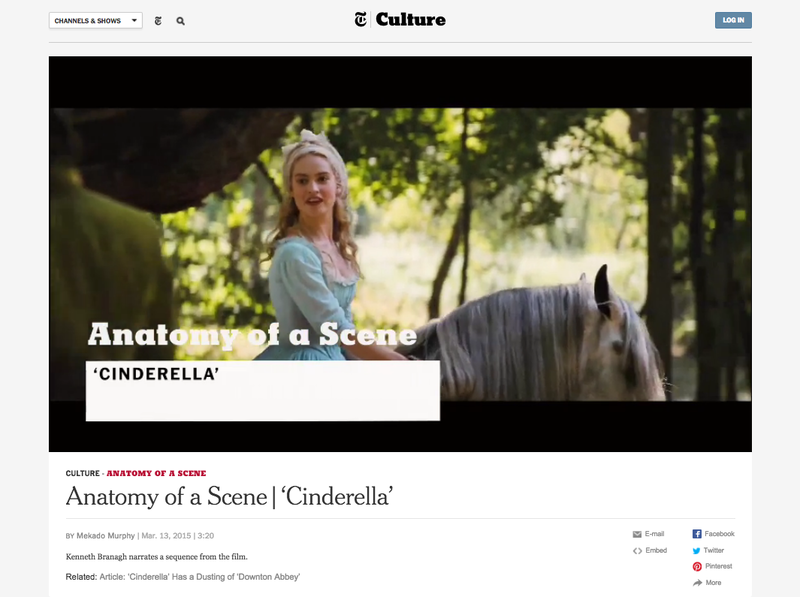 The online New York Times has an ongoing feature, Anatomy of a Scene, where film directors walk viewers through a single scene of their movies, "showing the magic, the motives and even some of the mistakes from behind the camera." Click here to check out Anatomy of a Scene "Selma"
It's fascinating watching, and offers story/writing insights – like how Dr. Martin Luther King, Jr. in the scene with his wife in the movie "Selma," is shown taking out the trash from under the kitchen sink, but not knowing where the new trash bags were kept because he hasn't been home enough to know. 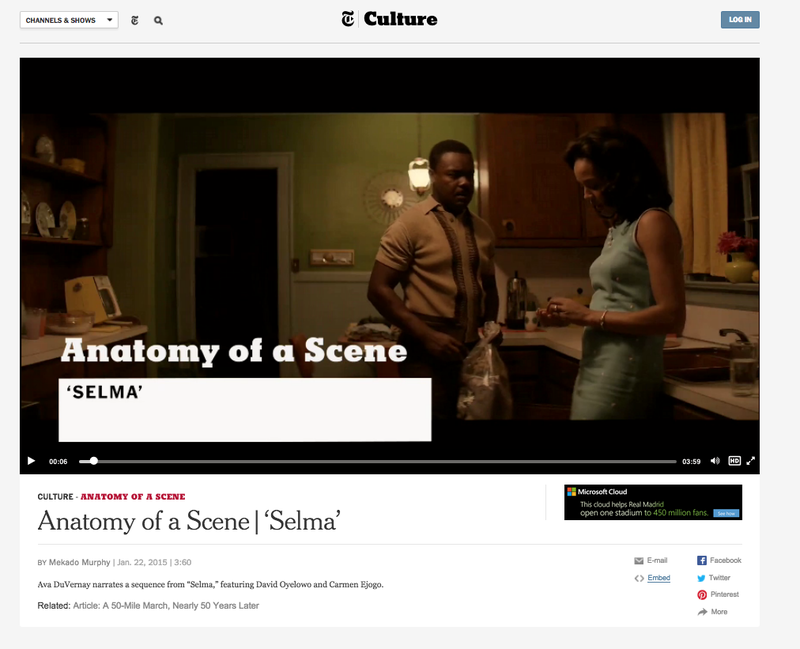 As director Ava DuVernay explains, they needed to "find places to humanize him." Click here to check out Anatomy of a Scene "Cinderella"
There are lots of different movies to watch narrated scenes from, and so many structural underpinnings, story logics, and visual elements to learn. 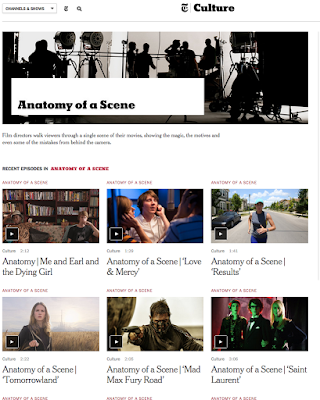 It's a great resource for all of us who tell stories. And maybe even a productive way to procrastinate a bit, too! Kristy Dempsey On Her Golden Kite-Winning Picture Book Text For "A Dance Like Starlight: One Ballerina's Dream" - And a chance to win a copy! This year's winner of the Golden Kite Award for Picture Book text is the remarkable "A Dance Like Starlight: One Ballerina's Dream" by Kristy Dempsey, illustrated by Floyd Cooper. Kristy: Thanks, Lee! I am still gobsmacked and moved to tears every time I think about it. Lee: Please tell us about your book. 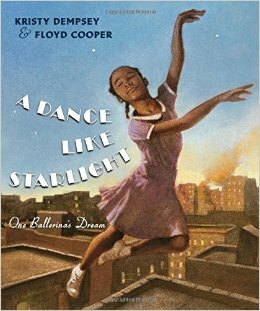 Kristy: A DANCE LIKE STARLIGHT is the historical fiction story of a young African-American girl who dreams of becoming a prima ballerina. She faces barriers each day because of the color of her skin and she doesn’t even know if she should dare to dream or if becoming a prima ballerina is just a wish that could never come true. When she hears that Janet Collins, the first African-American ballerina to dance with a major ballet company, will perform with the Metropolitan Opera Ballet, her mother sacrifices to take her to see the performance. Janet Collins was actually the first African-American ballerina to perform under contract at the Met. The event was highly publicized in advance and the audience was not segregated. There were published anecdotes from those who witnessed Collins’s performance and though the little girl whose story I have written is not based on any one person, her response echoes the thrill, the satisfaction and the wonder of those who did witness Janet Collins’s electric performance and this historic barrier-breaking accomplishment. Lee: How did the story take shape to be from the young girl’s perspective? Kristy: As a child, I went to a concert during which I was moved to tears by the singer’s performance. I remember wondering what it must feel like to be able to affect the emotions of your audience in that way. As I read about Janet Collins’s performance, I realized that the story I wanted to tell was about the child in the audience who, for the very first time, sees that her own dream could be possible. For me, the most interesting angle of this story was this child watching the stage with wonder and hope, and beginning to believe that she might be able to accomplish her own dreams as well. dripping all my dreams onto my Sunday dress." Talk to us about how to capture emotion. Kristy: For me, the heart of all story is the emotion. There are an infinite number of story ideas, characters, settings, and plots, but the emotion is what makes each universal and relatable. Our cultures, our backgrounds, the barriers we have faced surely vary and those inform the story as well. But emotion can draw the reader into an empathetic understanding of something they’ve never experienced. I have never experienced the racism that my main character experienced. Or the barriers that Janet Collins had to overcome. So at the outset, I knew that there were cultural aspects of this story that I must carefully communicate. But at the heart of this story was a little dreamer watching her dream become a possibility. I had experienced the hope and wonder that was the result of being moved to tears by an incredible performance. I knew what that felt like and I could put it into words. So, while I worked very hard to give my reader an understanding of the historical context in which this story takes place, I also wanted my reader to connect to the desire this little girl has as a dreamer. I used my own dreams and feelings as an entryway into describing the emotion of my main character. 1. Make it personal. Brainstorm ways to describe your own emotions from a similar situation and make a list of the descriptive phrases. 2. Research the context to strengthen the backdrop of your story. I thought of each scene in this story much like the scenery in a play. The small details that I hint at in the text –where they lived, what their home looked like, how much it cost to purchase tickets to the performance, etc – support the emotion in the story by providing a passage for the reader into that time period. It deepens the reader’s understanding of how tender the main character’s hope might have felt. 3. Use action to show emotion. In the excerpt above, the main character is crying and she describes it as if her tears are the culmination of her hope welling up and spilling over. There are other examples in the story of this same type of description. Fidgeting shows excitement, turning away shows embarrassment, twirling beneath moonlight shows contentment. Allow the reader to perceive your characters’ emotion through their actions. It’s the classic tip of SHOW, don’t TELL! Lee: Speaking of emotion, what did it feel like when you saw Floyd Cooper’s illustrations for your words for the first time? Kristy: I was a puddle. Of course, any writer would have been grateful for and overwhelmed by Floyd’s masterful depiction of her words. But a specific set of circumstances contributed to what I felt in that moment. First, when I originally wrote this story, one of my critique partners, Anne Marie Pace, read it and said, “I’d love to see Floyd Cooper illustrate this.” That dream felt too big to hold in my heart at the time, but it took root. I’ve always been mesmerized by Floyd’s art and couldn’t even begin to imagine what stars would have to align for that to be a possibility. Then, I went through a series of significant revisions where I lost hope and wondered if this manuscript would ever be viable. And finally, once the manuscript was acquired by Philomel, AND they actually had asked Floyd to illustrate it, AND he actually had agreed, it still took another 6 years for the book to be worked into his schedule and to be published. So as I opened up that package with the F&Gs, it was after 10 years of my own dreaming to see this book come to fruition. Floyd’s art was definitely worth the wait. To be honest, I sobbed! I was a perfect picture of “all my hoping wells up and spills over, dripping all my dreams . . .” onto the floor in front of me. Lee: Awww! That's heart-warming! In addition to being celebrated and receiving your Golden Kite Award, you’ll also be on faculty at the upcoming 2015 SCBWI Summer Conference. You’ll be giving a Saturday afternoon breakout workshop on HOW TO NOT HAVE A NERVOUS BREAKDOWN WHILE WAITING. Can you give us a sneak peek? Kristy: Well, it’s a workshop born out of my personal experience. I really believe that to be successful at this career you have to learn to wait well while nurturing and controlling the inner chaos that drives your creativity. Waiting for responses from agents and editors, waiting for the publication machine to turn its slow-moving wheels, waiting for illustrators’ schedules to align, waiting for your own ideas to gel into something worth pursuing . . . it’s enough to make anyone with a creative drive feel a little insane at times. My workshop will be part inspiration/pep talk and part practical activities on living and maintaining the creative life. Lee: How long have you been a member of SCBWI, and how has it contributed to your career journey? Kristy: This is my 10th year of membership in the SCBWI. I live in Brazil where there are very few SCBWI members and SCBWI has provided me with a diverse worldwide community of colleagues who encourage, critique, educate and hold me up! I began writing A DANCE LIKE STARLIGHT about the same time I joined SCBWI and then went through revision and a journey to publication that follows those same 10 years of my membership in SCBWI. Being honored with the Golden Kite Award for this book feels like a culmination of the knowledge, community and experience I gained as a member of the SCBWI. Lee: What three things are you most looking forward to about the conference? 3. and soaking up the creative energy! I work full-time as a school librarian in Brazil and most of my access to other creative professionals is online, so I am especially looking forward to this in-person chance to mix with a diverse group of industry professionals. You can join Kristy and all the other amazing faculty at the 2015 SCBWI Summer Conference. Details and registration information here. 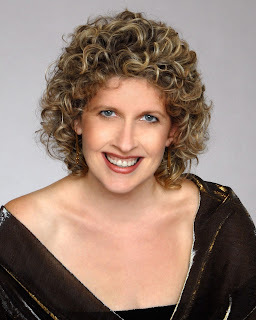 And to find out more about Kristy, visit her website here. Would you like a chance to win a copy of "A Dance Like Starlight?" Then leave a comment, and in one week we'll randomly choose a winner. Good luck! 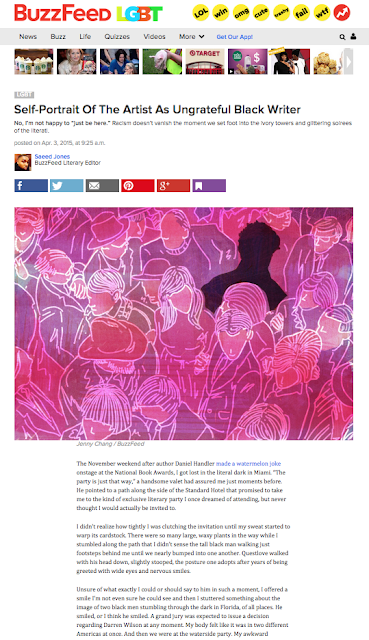 "Self-Portrait Of The Artist As Ungrateful Black Writer" - An excellent article to read. And consider. Saeed Jones, Buzzfeed literary editor, speaks out in the face of "literary microagressions," and shares what it's like to brave a climate where "The publishing industry on which my work depends is 89% white." SCBWI Insight - The Latest Benefit of Membership! 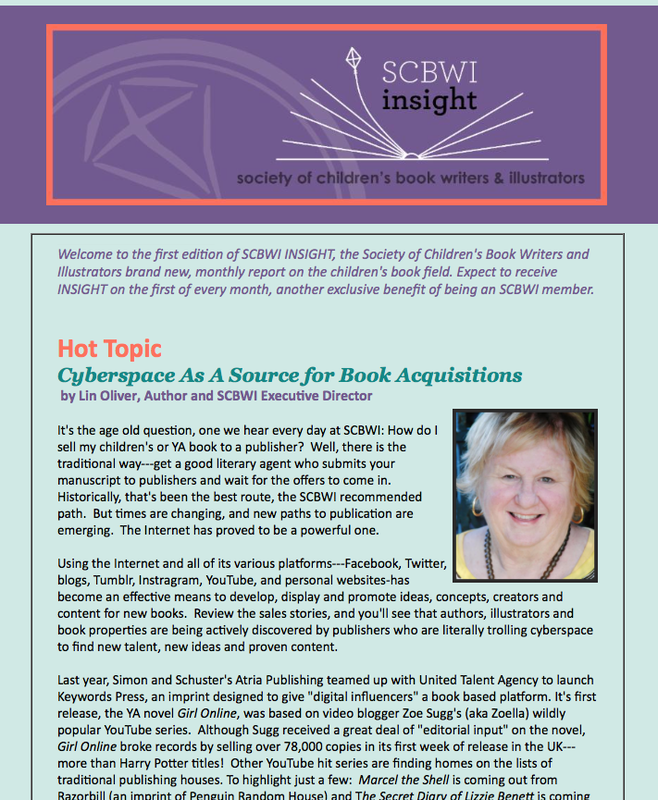 SCBWI Insight is a new, monthly report on the children's book field. Members will receive their copies of Insight on the first of every month. 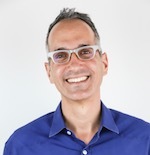 In this article, Lin Oliver, Author and SCBWI Executive Director explores new paths to traditional publication, exploring examples from Twitter, Blogging, YouTube, Facebook and authors' and illustrators' websites. 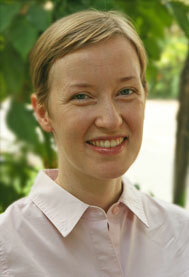 A profile and Q&A with VP & Publisher Allyn Johnston of Beach Lane Books, an imprint of Simon & Schuster. This month Dolly's Books in Park City, Utah, weighs in on what books readers "can't put down" and how the store is open to being contacted directly by local authors and illustrators. Full-time Illustrator Jannie (who started out as an in-house designer at Nickelodeon, Scholastic and an art director at TIME Magazine for Kids) answers questions aimed to help other working illustrators, including advice about how to break into children's magazines. Linda Sue Park shares the best single piece of advice she's ever received. No surprise, it's brilliant. But then, so is Linda Sue Park! 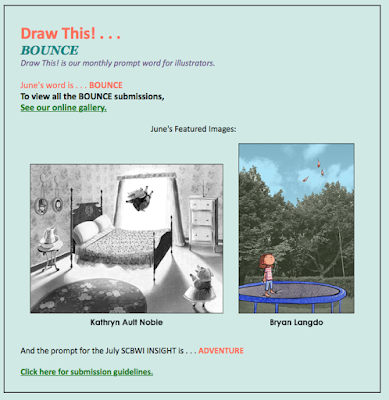 BOUNCE was June's word, and the featured images are from Kathryn Ault Noble and Bryan Langdo. A chance to get that first line (of a picture book or novel) noticed! Wanna read these articles, enter your work for Draw This! (July's prompt is "Adventure") and maybe enter the Funny First Lines contest, too? Members can. We hope you join us! Find out all the details (and other benefits) of SCBWI membership here. 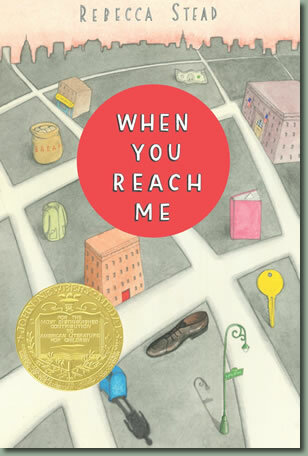 Rebecca Stead is the author of the Newbery Award-Winning "When You Reach Me." 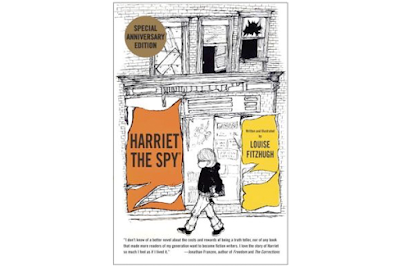 In her end-of-the-book tribute to Louise Fitzhugh's classic "Harriet The Spy,"
"Some people write in order to know themselves. Others, like me, write in order to feel known by others." Consider what it is for you. "When I was very young, I was preoccupied with the idea that I was stuck alone inside my own consciousness, that my mind was a place no one could enter, a place I could not escape. The world of my own thoughts and ideas made me feel, among other things, lonely. "Until I discovered books. Books were my first windows into the interior worlds of other people. And my wish to write, which grew–still grows–from the experience [of] reading, is mostly a desire to connect by sharing what goes on in my head. Writing is both invitation and escape, a way to express ideas, emotion, observations, fantasies, fears, and above all, questions. For me, writing, a lonely profession, is also an antidote to loneliness." -From page 323 of the Special Anniversary Edition of "Harriet The Spy," original text copyright 1964, tribute copyright 2014. In an interesting side-note, it was recently announced that in addition to continuing to write her own books, Rebecca is becoming a literary agent. You can read more about that here.